The inhabitants of a far-flung desert world have discovered an ancient hyperdrive core and a mysterious guidestone that tells of their exile in ages past. The journey to discover their origins is fraught with peril, as they encounter pirate raiders, navigate interstellar hazards, and finally confront the ruthless empire that banished them eons ago. Guided by their Mothership, the exiles must build up their fleet and acquire allies if they are ever to set foot on their true homeworld. As a fan of the original Homeworld, I was incredibly excited when I heard about the Homeworld Remastered collection. It was one of my favorite RTS games, but with the relentless march of technology, playing it had become more or less impossible. Because of this, finally having the opportunity to play an old favorite with updated graphics was something I looked forward to immensely. At the time of writing, I have not played the original edition of Homeworld 2, nor its remastered version. Because of this, I will only be reviewing Homeworld Remastered for now. Additionally, there will be minor spoilers for some of the missions, so please proceed with caution. 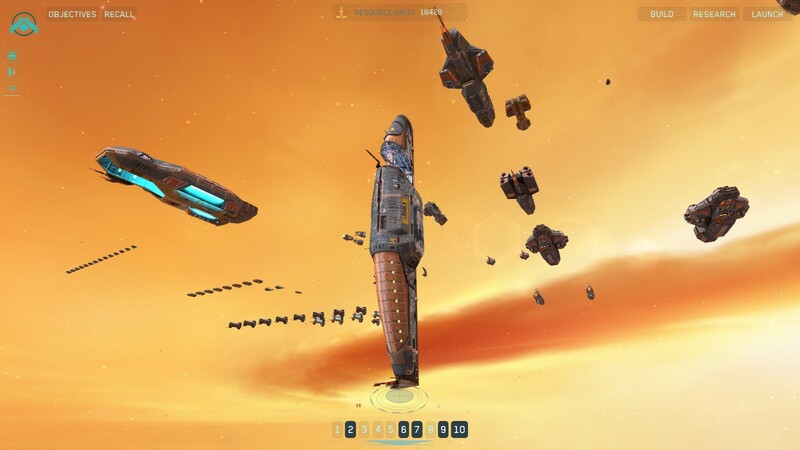 Homeworld Remastered is, for the most part, a very worthy successor to the original. It looks and sounds wonderful, and it gives both old fans and new players the chance to enjoy one of the best stories in strategy gaming. Unfortunately, some of the game’s complexity and tactical control has been taken away, which is just a bit disappointing. While it doesn’t break the game, it may come as an unpleasant surprise to those who looked forward to the remastering. The visuals of the original game were quite good at the time, and the remastered version is absolutely gorgeous. All of the ships boast new, highly detailed textures and effects, while remaining true to the solid, heavy-duty aesthetic they always had. While they are still using relatively simple models, the sheer scale of the units in the game makes this a minor issue at most. Along with the ships, the galactic vistas make each mission beautiful to behold. The game’s audio has also stood up very well. The deep, echoing sounds of plasma thrusters and chattering mass drivers are very satisfying, lack of sound in space be damned. Homeworld’s famous soundtrack also remains intact, capturing the awe and melancholy of the exiles’ voyage perfectly. The voice acting, while not the best I’ve ever heard, works well and does manage to convey strong emotion during a few very poignant moments. 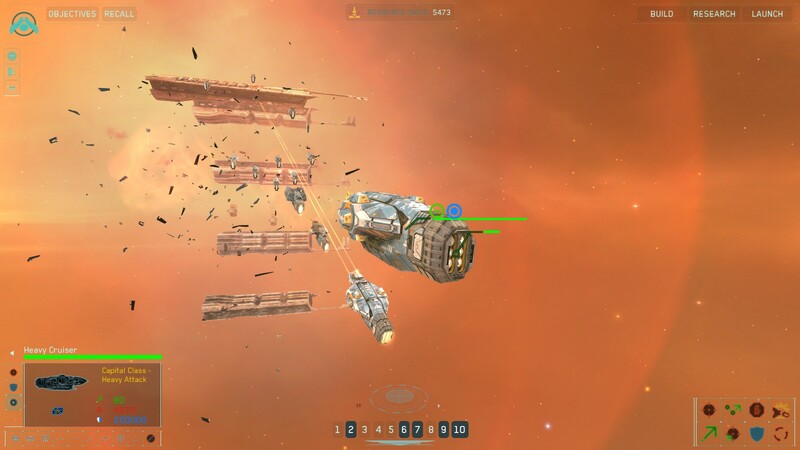 Homeworld also boasts varied and compelling mission design. Scenarios range from fighting off swarms of enemy strike craft to searching a dangerous ship graveyard for crucial intelligence. The game keeps its missions fresh and unique by setting up interesting situations. One mission in particular takes place in an area bathed in radiation from an exploding supernova. In order to reach their objective, the player’s fleet must carefully navigate bands of space-dust to avoid damaging its ships. These kinds of quirks help ensure that each mission brings something new, and it rarely feels like you’re just going through the motions as you play. Not all missions are as clever or exciting as the one described above, but other than a few potentially frustrating segments, they are all quite good. 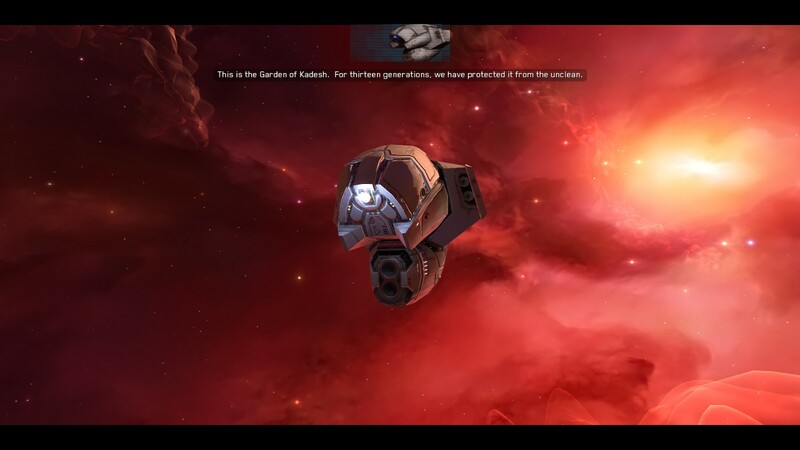 The core gameplay of Homeworld Remastered remains effectively the same as its progenitor. The player controls a fleet of vessels that persists between missions, accomplishing objectives before making the hyperspace jump to the next stage. Along the way, they must harvest resources to construct additional ships and research designs for new vehicles. Ships range in size from small fighters and corvettes (collectively called strike craft) to frigates, destroyers and massive cruisers (capital ships), and all have their place in tactical combat. Most vessels have a few unique traits or abilities that keep them distinct. Defenders act as mobile turrets, blasting away at enemy strike craft, while Ion Cannon Frigates focus solely on destroying enemy capital ships. In large groups, unarmed Salvage Corvettes can swarm and capture enemy vessels, dragging them back to the Mothership to be added to your own forces. I got enough utility out of the different ship types to use each of them quite a bit, which I feel indicates at least a decent unit balance. By far though, the greatest strength of Homeworld is its story. The remaster does nothing to change the plot, so this section is less of a review and more a retrospective. As mentioned earlier, there will be some minor spoilers here, so feel free to skip the next few paragraphs if you want to be surprised when you play. Many strategy games try to make the player feel powerful or clever as they triumph over their foes. Here, Homeworld does the precise opposite; it gives the player a sense of utter powerlessness in the face of an unbelievable loss. The mournful music, the simple image of a planet burning below, and the voice of the Fleet Intelligence officer cracking as he tries to deliver a status report all work together to make that moment so devastating and heart-wrenching. I have rarely played a game since that has delivered such a powerful gut-punch so effectively. On the whole, Homeworld delivers a very strong narrative around the search for home. 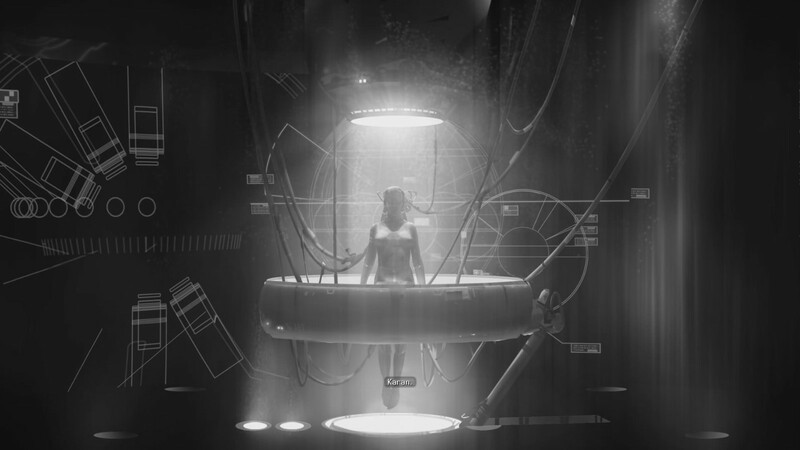 The simple black-and-white cutscenes were almost certainly used initially due to time and/or budget restraints. 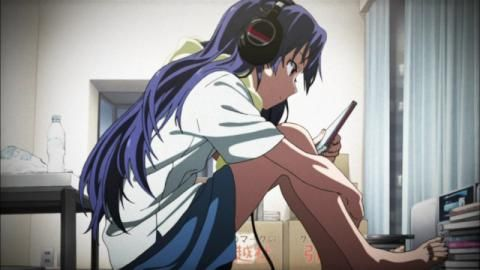 However, they convey plot points clearly, and don’t fall into the trap that many modern games find themselves in, where what happens in cutscene is so much more impressive than the actual gameplay. 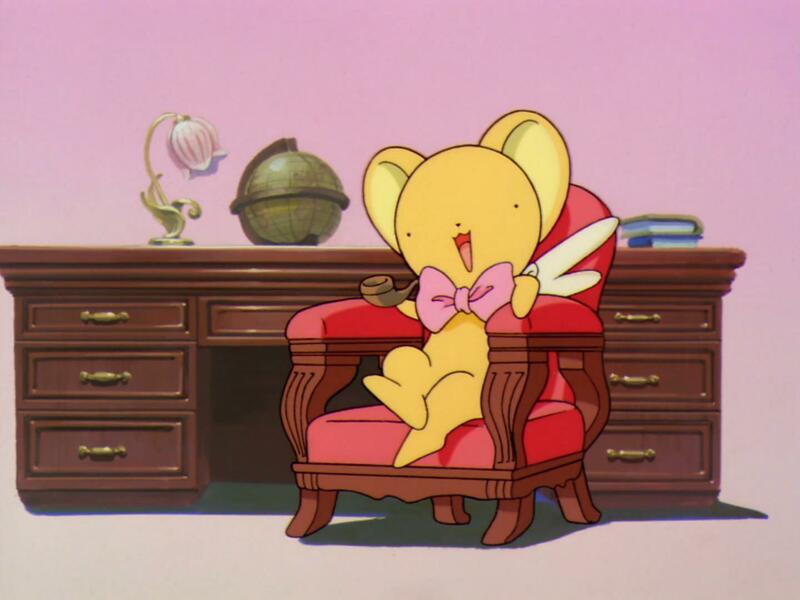 It’s nice to see that the creators cared enough about the story to focus on it in spite of their restrictions, rather than sweeping it under the rug due to technical limitations. Even outside of the cutscenes and dedicated story moments, Homeworld still manages to show its storytelling chops. One mission takes place in a starship graveyard, amongst the floating hulks of ancient vessels. In the background, gargantuan curved hull sections obscure the space beyond, offering a staggering sense of scale. Who could have built such a thing and what became of them? It drives home the idea that as much as you care for the exiles, they are just a small part of an infinite galaxy, and their story is just one part of a vast interstellar tale. Up until now, most of elements I’ve been describing have been unchanged or even improved by the remastering. Other than the graphics, any of these points could be a review of the original. 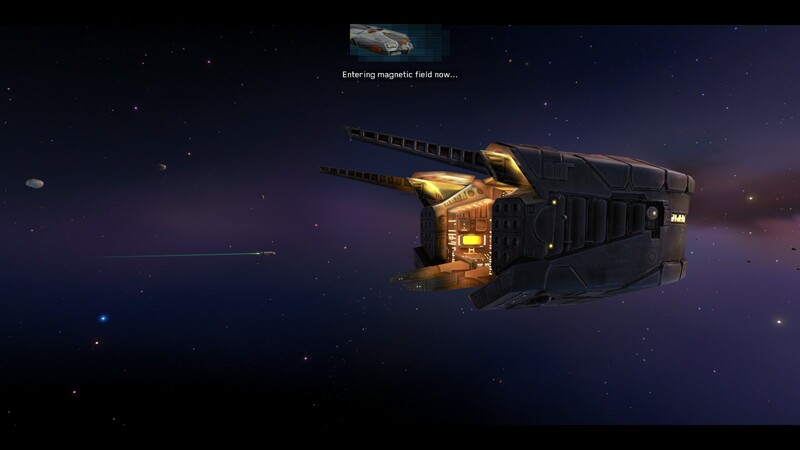 However, Homeworld Remastered does make some significant changes to gameplay. It is here that the game fails to live up to its potential, and it is the one thing that keeps me from recommending it unconditionally. The biggest change between the original and remastered games is in how ship tactics and formations work. In the original game, ships could be placed in a variety of formations that would augment their effectiveness in combat. Even more importantly, shifting tactics between defensive, evasive, and aggressive modes dramatically changed how ships behaved. Evasive ships would break formation and avoid incoming fire, while aggressive ones would hold tight and bring all their firepower to bear on individual targets. Switching between these behaviors as battles evolved was crucial to your success, and gave the player a strong sense of command over your fleet. In the remastered game, formations and tactics are still present, but have been greatly simplified. Ships only remain in formation until they engage in combat, at which point they maneuver as they please. While you can set them to passive, aggressive, or defensive modes, these changes do not feel nearly as significant as before. The whole affair feels much less hands-on and takes away a lot of control, which often left me selecting all of my ships and just throwing them at the enemy rather than carefully managing the battle. It was an unfortunate step backward for a game that had previously relied on firm control to manage tricky battles. There are other minor issues with the gameplay, though none are as noticeable as the loss of tactical control. Selecting all ships of the same class doesn’t select captured enemy vessels of that class, which makes it annoying to set up large units of capital ships. While there are some differences in weapon layout between constructed and captured ships, it’s not enough to drastically change their utility, so the decision to separate them seems unnecessary. This and other minor changes to the strength and durability of several ships made managing the fleet feel more clunky than I remembered. Though the hit to control is a serious one, it is not enough to stop me from recommending Homeworld Remastered. It isn’t flawless, but then neither was the original game. The sleek visuals, amazing soundtrack and gripping story are good enough to pull the game far above average. Old fans may find the changes to gameplay a bit grating, but I think it’s a small price to pay for the chance to enjoy the game once more. New players who aren’t subject to such nostalgia will also be well-served with a solidly built and aesthetically stunning RTS. Once again, it is time to lead our people home.